Land in Apulia and Samnium is granted to veterans from Scipio Africanus’ army. During the years discussed here – 201-188 BCE – the Roman Republic became more deeply involved in Greek affairs. The Romans defeated two kings that ruled over so-called Successor Kingdoms, Hellenistic states established after the death of Alexander the Great (356-323 BCE). King Philippos V of Macedonia (see the image above) and King Antiochos III the Great, ruler of the Seleucid Empire (see the fifth photo in this post), both had to bow before the might of the Roman armies. Before discussing the details of the year 201 BCE, I feel it is useful to first provide some background information about the relations between the Romans and Greeks during the previous centuries. The Romans had been in contact with the Greek world for centuries. They had established relationships with the Greek colonies in Southern Italy since about 600 BCE and by the early third century BCE, they had come to dominate this part of the peninsula, which was known to them as Magna Graecia. Roman rule did not go unchallenged. A conflict with the Greek colony of Tarentum, founded by colonists from Sparta in 706 BCE, led to an intervention by King Pyrrhos of Epirus, one of the greatest generals in Antiquity. 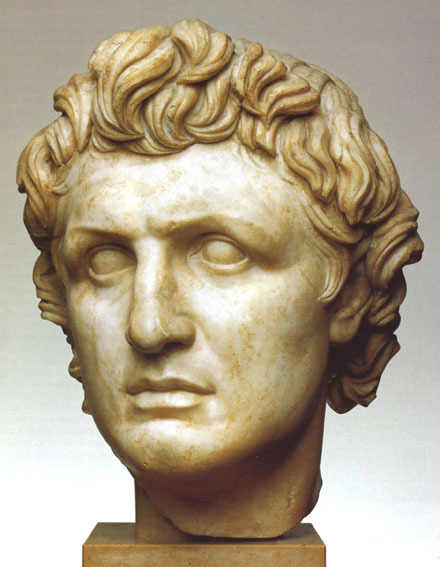 The fact that the Romans managed to fight him off, despite suffering horrible losses, cemented their reputation in the Classical World. Pyrrhos of Epirus (photo: Catalaon). It is clear that the Romans learned much from their Greek neighbours. They copied some of their architecture and technology (especially military technology with regard to shipbuilding and artillery), began identifying their own gods with those of the Greeks and appreciated the Greek cultural achievements. When he was sent as an envoy to Tarentum in 282 BCE, the former consul Lucius Postumius Megellus was able to address the Tarentines in Greek. Furthermore, the first Roman historians – Fabius Pictor and Cincius Alimentus – wrote their works in the Greek language. By contrast, the Roman poet Livius Andronicus (ca. 284-205 BCE), who wrote in Latin, was originally a Greek from Tarentum. During the First Punic War, the Romans brought Sicily under their control, including most of the Greek colonies on the island. An exception was Syracuse, by far the largest and most important city on Sicily. Syracuse had been founded by colonists from Corinth in 734 BCE. In 263 BCE, King Hiero of Syracuse deserted his Carthaginian allies and made an alliance with the Romans instead, which was to last until his death almost fifty years later. Hiero died at the height of the Second Punic War, and after his death, the city soon defected to Hannibal. It was retaken by the Roman general Marcus Claudius Marcellus in 212 BCE. Marcellus showed his appreciation for Greek culture by stripping the city of most of its art and sending all of it to Rome. But not everyone in Rome was gobsmacked by the Greek language and fine Greek culture. Conservative politicians like Marcus Porcius Cato (ca. 234-149 BCE) advocated old school Roman virtues, values and traditions. It was these politicians who accused the great general Publius Cornelius Scipio, known for his philhellenism, of unpatriotic and un-Roman behaviour. During the First and Second Illyrian War, the Romans crossed the Adriatic Sea to fight the pirates that were threatening their merchant ships. Greek cities such as Apollonia and Epidamnos put themselves under Roman protection and became friends and allies of the Roman people. The Romans did not leave any permanent garrisons here, but they were now one step closer to the Greek heartland nonetheless. When King Philippos V of Macedonia allied himself with Hannibal after the Roman defeat at Cannae in 216 BCE, the Romans responded by declaring war on the king. Although they were already fighting the war against Hannibal and the Carthaginians on many fronts, the Romans, with their inexhaustible pool of manpower, found soldiers, marines and ships to attack Macedonia and its allies during the First Macedonian War (215-205 BCE). King Attalos I of Pergamum (photo: Nicolás Pérez, CC BY-SA 3.0 license). Macedonia’s enemies soon became Rome’s new allies, and the Aetolian League, Sparta, Messene, Elis and King Attalos I Soter of Pergamum joined the war on the Roman side. The Roman commanders Marcus Valerius Laevinus, Publius Sulpicius Galba and Publius Sempronius Tuditanus led the Roman campaign and did so competently, although they never had the manpower to stage a full-scale invasion and had to confine themselves to raids. In 205 BCE, the Peace of Phoinike was signed, basically restoring the status quo ante bellum. The First Macedonian War had ended in a draw, and this was not how the Romans liked their wars to end. It is clear that, now that peace with Carthage had been made, many of Rome’s leading politicians were eager to renew the war with King Philippos and this time win a decisive victory. But they had to be wary of another king as well, Antiochos III of the Seleucid Empire, or ‘Syria’ as it is often called in our sources. Again, some background information is in order. When Alexander the Great died in Babylon in 323 BCE, his vast empire was soon divided among his generals. These were called the Diadochoi or Successors. Soon these began fighting among themselves. One of the most powerful of the Diadochoi was the one-eyed Antigonos I Monophthalmos (382-301 BCE), founder of the Antigonid dynasty. 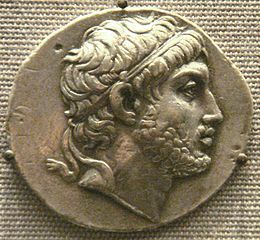 He was defeated and killed in 301 BCE at the Battle of Ipsos by his rivals Lysimachos, Seleukos I Nikator and Kassandros. The fourth diadochos in league against Antigonos was not present at Ipsos. His name was Ptolemaios, the ruler of Egypt. The Battle of Ipsos was a pivotal event in history. Twenty years of almost constant warfare had created four Successor Kingdoms. First of all, there was Macedonia, ruled by Kassandros. Kassandros was notorious for having murdered Alexander’s mother Olympias, his Baktrian wife Roxane and his son Alexander IV, thus ending the Argead royal dynasty. 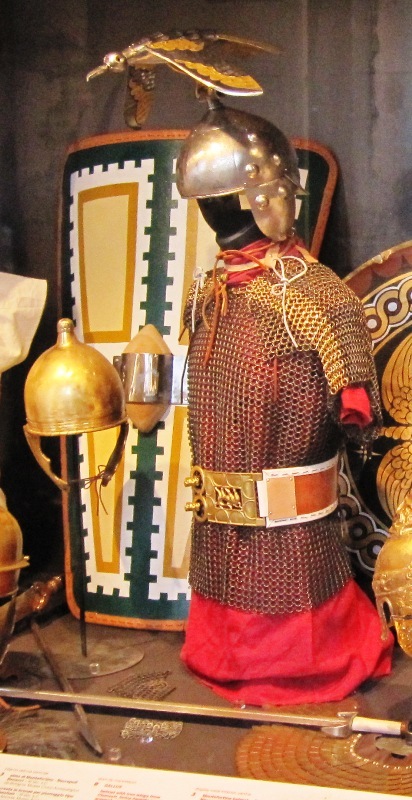 Kassandros’ own Antipatrid dynasty – named after his father Antipatros – did not survive long and by the time of the First Macedonian War, the Antigonids had been firmly on the Macedonian throne again for decades. Philippos V was a great-great-grandson of Antigonos I Monophthalmos. Lysimachos, briefly King of Macedonia between 286 and 281 BCE, ruled Thrace and much of Asia Minor, but in 281 BCE he was defeated and killed in battle by the aforementioned Seleukos. This was the end of his kingdom, most of his territories falling to the Seleucids. 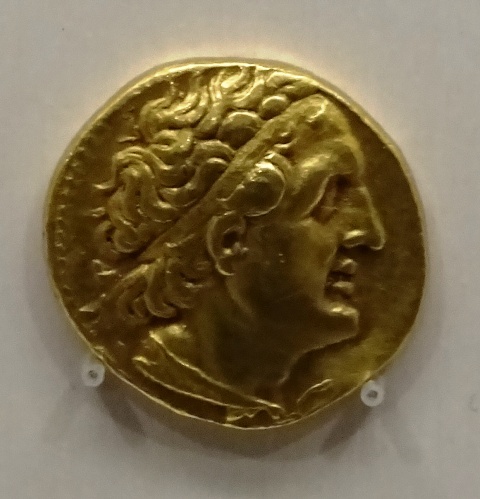 Golden coin (trychryson) of Ptolemaios I (Rijksmuseum van Oudheden, Leiden). The Seleucid Empire was the third and by far the largest of the Successor Kingdoms, at times comprising Syria, parts of Asia Minor, Mesopotamia, Media, Persia and many territories even further east. It was also the most overextended and ungovernable kingdom. Soon the easternmost parts broke away. A Greco-Baktrian kingdom emerged in Central Asia and a tribal leader who assumed the royal name of Arsaces became the founder of the Parthian Empire. 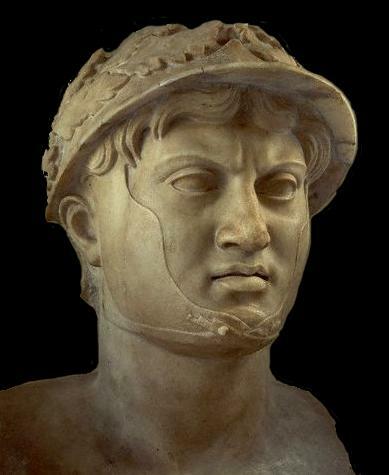 The Seleucids were also constantly at war with the fourth Successor Kingdom, the Ptolemaic Empire. The heartland of the Ptolemies was Egypt, which the first Ptolemaios (see the image on the right) had ruled first as a satrap and then as a pharaoh, the traditional title held by Egyptian kings. But the king and his successors also controlled Cyprus, Cyrenaica, Cilicia and Pamphylia, and at times held nominal control over some islands in the Aegean and territories in Thrace. A bone of contention between the Seleucids and Ptolemies was the region known as Koile (or Coele) Syria, which comprised parts of modern Syria, Lebanon and Israel. Six so-called Syrian Wars were fought between the two kingdoms over the course of time. 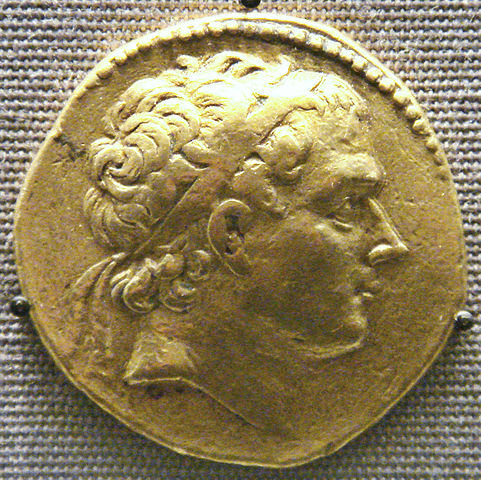 In 204 or 203 BCE, King Ptolemaios IV Philopator died. The king had been a weak ruler and a party animal, but at least he had done one thing right: during the Second Punic War, presumably in 211 BCE, he had sent grain to the Romans just when they needed it the most, thus honouring the friendly relationship that had existed between Rome and the Ptolemaic Empire since 273 BCE. The king’s kind actions ensured him of lasting Roman support. His son and successor Ptolemaios V Epiphanes surely needed it. He was just five or six years old when he ascended the throne and was completely dominated by his guardians. Soon the kingdom was in turmoil. The boy’s mother Arsinoe was murdered, one of the guardians got into a conflict with one of the generals of the army and the soldiers of the guard began to mutiny. There was much bloodshed and the Ptolemaic Empire was obviously reeling. King Antiochos III the Great (photo: Uploadalt/British Museum). This was exactly what Macedonia and the Seleucid Empire had been waiting for. Philippos V and Antiochos III made an alliance and agreed to pry away some territories from the Ptolemies. The Macedonians, who wanted to become a dominant naval power in the Aegean again, were to attack and annex the island of Samos and parts of Asia Minor, while Antiochos would once again try to conquer Koile Syria (his first attempt had failed in 217 BCE). Philippos did not confine himself to attacking Ptolemaic territories. In 203 BCE, he advanced on Kios on the Propontis (now the Sea of Marmara), took the city and gave it to his ally, King Prusias I of Bithynia. Kios had been stormed and sacked under the eyes of envoys from the island of Rhodos. These had tried to convince the king to be merciful, but Philippos had sold the population of Kios into slavery instead. There had already been tensions between Rhodos, a mercantile power in the region, and Macedonia, because the latter supported Cretan pirates who preyed on Rhodian merchant vessels (part of the so-called Cretan War). These tensions were now running dangerously high. Kios had furthermore been a member of the Aetolian League and an Aetolian general had held command during the siege. The Aetolians had been at peace with Macedonia since 206 BCE, but now they had every reason to be wary again. Philippos managed two wrest more cities from the League, Chalkedon and Lysimacheia. Chalkedon was directly opposite Byzantion, while Lysimacheia was in Thrace. It had been founded by Lysimachos (see above) and had later been part of the Ptolemaic Empire, but Egypt was much too far away to offer effective protection. At some point in time, the city had joined the Aetolian League. Philippos’ goal was clearly to gain control of the access to the Black Sea, and this was a serious threat to the commercial interests of Rhodos. The king also managed to conquer the island of Thasos off the Thracian coast, selling the inhabitants of its main city as slaves. Map of Greece and Asia Minor; theatre of the wars between Rome, Macedonia and the Seleucid Empire (source: Ancient World Mapping Center. “À-la-carte”; CC BY 4.0). In 201 BCE, Philippos continued his expansionist campaign by first taking Samos from the Ptolemies and then attacking the island of Chios off the coast of Asia Minor. Chios was close to Pergamum, another traditional enemy of the Macedonian kings. Pergamum, Rhodos, Byzantion and Kyzikos sent ships to engage Philippos’ fleet. The ensuing Battle of Chios was a bloody affair, but in spite of greater Macedonian casualties, it probably ended in a draw. The Macedonian king lost his flagship, a huge vessel known as a ‘ten’ (dekeres). But King Attalos of Pergamum pursued the enemy ships too carelessly and was forced to run his own flagship ashore and flee when he was cornered by the Macedonians. The Rhodian admiral was mortally wounded during the battle. Although sources like Polybius try to present the Battle of Chios as a decisive victory for the anti-Macedonian alliance, it is clear that Philippos still had plenty of troops and ships at his disposal to continue his campaign. The king landed near Pergamum and began to ravage the countryside. The city itself was too tough a nut to crack, but Philippos was notorious for destroying temples and sanctuaries, and his campaign in Attalos’ territory was no exception. Although the precise order of events is not clear, there was another naval battle this year at Lade, in which the Macedonian fleet inflicted a minor defeat on the Rhodians. Philippos continued his land campaign in Karia, especially in the part known as the Peraia, which was traditionally Rhodian territory on the mainland. It is hardly surprising that both Pergamum and Rhodos sent envoys to Rome to gain Roman support against the Macedonian king. Their opposition against Philippos this year seems to have been rather lacklustre, and it is not impossible that they were counting on a Roman intervention. Philippos realised that such an intervention was a serious possibility. He also needed to prepare for possible Aetolian incursions now that the League was furious about his actions at Kios, Chalkedon and Lysimacheia. At the end of a successful campaigning season, he therefore returned to his kingdom, evading the naval patrols of the Pergamenians and Rhodians. The Romans sent a delegation to King Ptolemaios V Epiphanes of Egypt to thank him for the grain aid that had been sent by his father during the darkest years of the Second Punic War. They also began campaigning in Gallia Cisalpina again. The conquest of Cisalpine Gaul had been more or less halted by Hannibal’s invasion and by the humiliating defeat of a Roman army by the Boii at the Battle of Litana forest in 215 BCE. Celtic tribes like the Boii and the Insubres had been defeated in several campaigns in the 220s BCE, but they were still far from subjugated and had rebelled even before Hannibal had arrived in Cisalpine Gaul. An additional problem for the Romans was the fact that they had two Latin colonies deep inside Celtic territory. Placentia (modern Piacenza) and Cremona had been founded in 218 BCE on both sides of the river Padus (now the Po). They were over 200 kilometres to the northwest of Ariminum, the usual staging point for Roman expeditions into Celtic territory. Placentia and Cremona were very vulnerable and often found themselves under attack. Not wanting to abandon these colonies, the Roman consul Publius Aelius Paetus campaigned against the Boii this year. He did not accomplish much, but a certain Gaius Ampius (a praefectus sociorum or prefect of the allies) was ambushed by the Boii while harvesting the grain. Ampius and 7.000 of his men were killed. There would be much more fighting the next year. Another important development this year was the fact that land in Apulia and Samnium, annexed during the Second Punic War, was allotted to veterans from Scipio’s army. This was probably the first time in Roman history that land was granted to veterans from the army. A special committee of ten men (decemviri) was set up to distribute the land. Polybius, The Histories, Book 15.20-15.33 and Book 16.1-16.11, 16.14-16.15, 16.21-16.22 and 16.24. The Tarentines, however, mocked Postumius for his accent and one of them even urinated on the Roman envoy’s robes as he left the theatre. See Dionysius of Halicarnassus, Book 19.5. Prusias was married to Philippos’ half-sister Apama. Prusias’ son, also named Prusias, was married to his daughter, also named Apama. The term peraia usually refers to the mainland possessions of island states. Many Greek islands had a peraia.